A blond twist on our ever-popular Rainbow wood needles, Sunstrucks golden layers of laminated birch allow every stitch to be beautifully displayed on a sun-kissed finish. The smooth, burnished surface of Sunstruck needles is perfectly balanced with just the right amount of grip, which works wonders for working with slick fibers like mohair, silk, and angora. Perfect for working with dark or variegated yarns, our Sunstruck needles have the same strength and stability that you know and love - all with a lighter wood finish that provides endless hours of enjoyable knitting. The metric sizing system is more precise than the US sizing system. We offer two US size 1 - equivalent to 2.25mm and 2.50mm and two US size 2 - equivalent to 2.75mm and 3.00mm. The 16" needle tips are 3 3/8 inches long, allowing for an easily formed complete circle for small circumference knitting. The 24", 32", 40" and 47" needle tips are 5 1/8 inches long. Since our cable is super flexible, the Magic Loop method of sock knitting can be accomplished with the 32" needles for one sock at a time. For two socks at a time, try either the 40" or 47" needles. First let me say I love these needles, especially the Sunstruck. They are beautiful and I love the way they feel to the hand. However, I just had a brand new 0 Sunstruck break half way through knitting a glove. I had knitted one glove, was about an inch into the palm of the second one and it just snapped in half on the grain line of the wood. I was really shocked as I have made several pairs of socks using other 0 size Sunstruck fixed circular needles without problems. I don't know if it just happened to be a defective needle or just weak at that one spot, but because my other Sunstruck size 0 are still being used in other projects (yup, I always have multiple projects going all at once, lol) I had to swap to a metal size 0 that is also from Knit Picks, which I am not as fond of using, but it works. 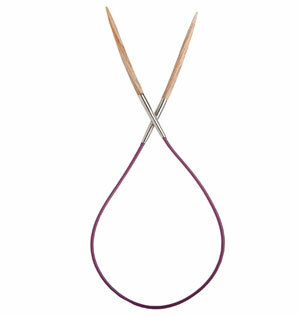 ;) Other than this one instance, I have had no problems with any of the Knit Picks wooden needles and love them! I'm in love with the size 0 in both Sunstruck and Caspian. The feel is just wonderful. Makes knitting socks a pleasure. Their inherent flexibility worried me at first--I thought they might break. But by loosening my knitting a bit I found them very comfortable. Now I can't imagine using any other needles for socks. These are my all time favorite needles, and I've tried a lot of them. I also have the interchangeable set. The finish is smooth but also offers that little extra grip to keep your yarn from getting away from you. I'm so glad that Knit Picks came out with a wood needle that was a nice light color. Thank you KP! I just received my order a few days ago of two 40" circular fixed cable needles in sizes U.S 2 and 3 and I love them. I bought them for the purpose of learning magic loop knitting. I made a quick baby hat this weekend using the magic loop technique & I love them. I plan to try 2-at-a-time magic loop socks next. I had hoped the cables might be a tiny bit more flexible but I don't know if that is even possible without sacrificing strength. The other minor drawback that I found (someone else also mentioned this) is that the transition between the metal & the wood snags the yarn just a tiny bit but not enough to be a major problem. The wood is just a tad larger than the metal connector so it seems like there might be some way to sand it down to make the transition more even but I'm afraid of creating more serious snags. Has anyone else found a solution to this issue? I was also concerned that such fine wood needles would break easily but the wood seems strong enough. I would say that my tension is fairly average - neither too tight or too loose. Overall, I am very pleased with my purchase. These needles feel & work quite nicely. I have been knitting for 50+ years.